Sunrise captures the elegance and grace that diamonds exude. This beautiful watch features a silver tone case and bracelet and a mother of pearl dial set with 10 diamonds. Also available in a gold tone, two-tone case and bracelet or on a black leather strap. 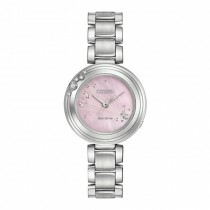 A burst of sparkle across the dial and bezel of this ladies Eco-Drive stainless steel watch - Pink dial - Stainless steel - diamond set dial - Diamond set bezel - Sapphire crystal glass - 50 meters water resistant - 5 year Manufacturers Guarantee - Citizen Presentation Box.